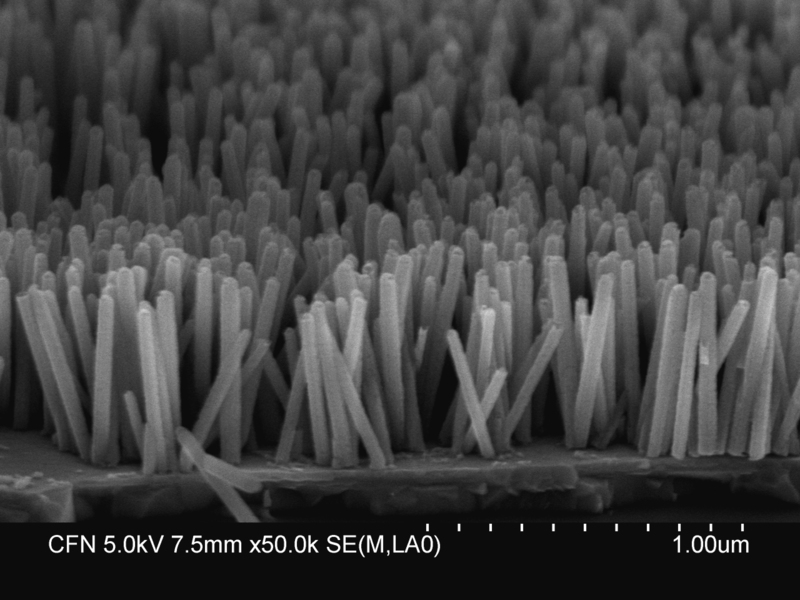 The scientists used a low-temperature approach to grow this nanowire array composed of zinc-oxide crystals. On average, the nanowires have a diameter of 40–50 nanometers (nm) and a length of 500 nm. No image credit. 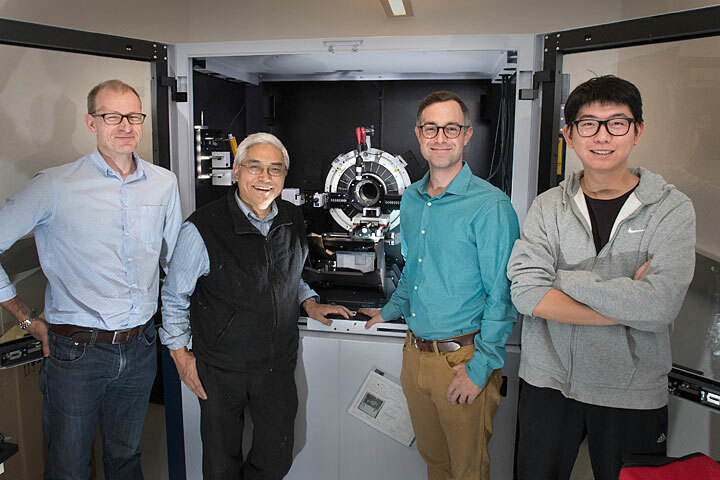 Scientists from Stony Brook University (SBU) have used a novel technique at the National Synchrotron Light Source II (NSLS-II)—a U.S. Department of Energy (DOE) Office of Science User Facility located at Brookhaven National Laboratory—to answer longstanding questions in medical imaging. 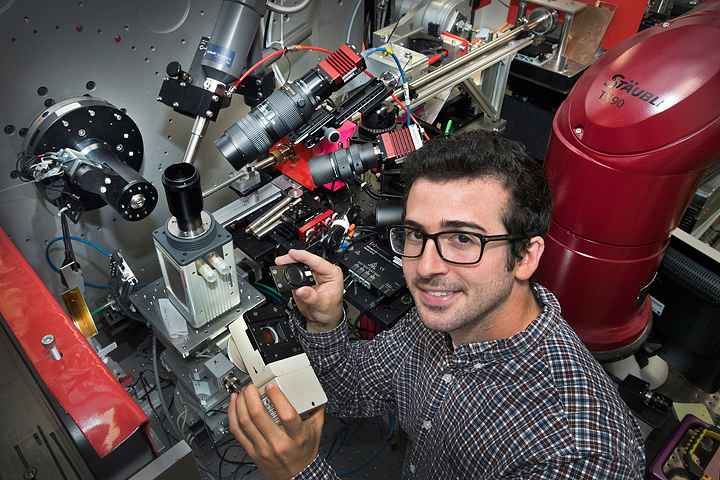 Adrian Howansky is pictured with equipment at NSLS-II’s x-ray powder diffraction beamline, where the Stony Brook group conducted their research. The team’s EMCCD camera is also shown. NSLS-II was one of the few places the SBU team could find the high spatial resolution and variable high-energy x-rays they needed to conduct their research. “But the proposal this team brought to NSLS-II was not within the scope of the beamline’s scientific program,” said Sanjit Ghose, the beamline scientist at 28-ID-2. 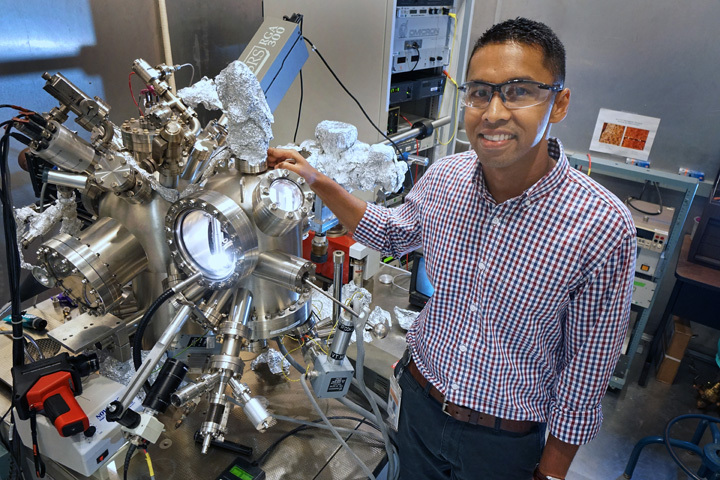 “The irony is that this beamline is one of the few places they could do their experiment.” Ghose and Eric Dooryhee—the group leader for the scientific program that includes beamline 28-ID-2—worked hard to ensure the SBU team would be able to conduct this critically important research at NSLS-II. Ghose noted that other scientists whose research does not fit within the scientific programs at NSLS-II beamlines can reach out to the beamline scientists to discuss research opportunities and potentially test the feasibility of their experiments. 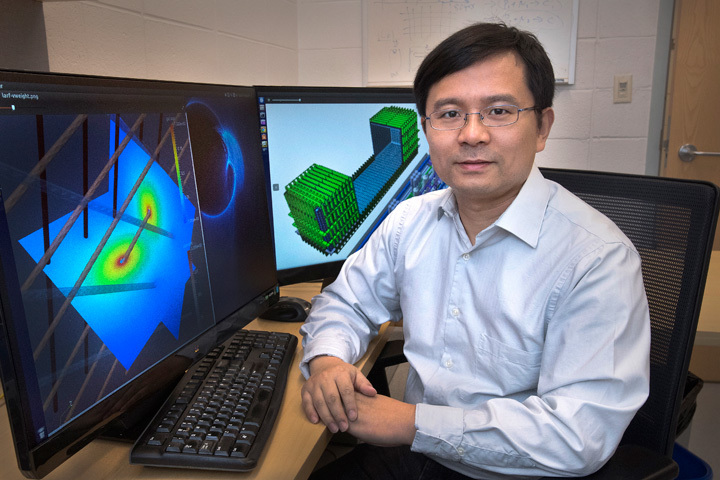 “The arrangement of this user facility makes a lot of research possible that otherwise wouldn’t be,” said Wei Zhao, a professor of radiology and biomedical engineering at SBU. Now that the SBU team has gained fundamental knowledge of the physics of scintillators, they have already begun to research deeper questions, and are working with industry to produce the next generation of x-ray detectors. In addition to improving x-ray detectors for medical diagnoses, the results of this study [SPIE] could improve x-ray detectors across the board, including those for dental imaging, security imaging, and synchrotron science. Xiao-Qing Yang (left) and Enyuan Hu (center) of Brookhaven’s Chemistry Department, pictured with beamline physicist Eli Stavitski (right) at the ISS beamline at NSLS-II. Scientists have designed a new type of cathode that could make the mass production of sodium batteries more feasible. Batteries based on plentiful and low-cost sodium are of great interest to both scientists and industry as they could facilitate a more cost-efficient production process for grid-scale energy storage systems, consumer electronics and electric vehicles. The discovery was a collaborative effort between researchers at the Institute of Chemistry (IOC) of Chinese Academy of Sciences (CAS) and the U.S. Department of Energy’s (DOE) Brookhaven National Laboratory. Lithium batteries are commonly found in consumer electronics such as smartphones and laptop computers, but in recent years, the electric vehicle industry also began using lithium batteries, significantly increasing the demand on existing lithium resources. “Just last year, the price of lithium carbonate tripled, because the Chinese electric vehicle market started booming,” said Xiao-Qing Yang, a physicist at the Chemistry Division of Brookhaven Lab and the lead Brookhaven researcher on this study. In addition, the development of new electrical grids that incorporate renewable energy sources like wind and solar is also driving the need for new battery chemistries. Because these energy sources are not always available, grid-scale energy storage systems are needed to store the excess energy produced when the sun is shining and the wind is blowing. Scientists have been searching for new battery chemistries using materials that are more readily available than lithium. Sodium is one of the most desirable options for researchers because it exists nearly everywhere and is far less toxic to humans than lithium. But sodium poses major challenges when incorporated into a traditional battery design. For example, a typical battery’s cathode is made up of metal and oxygen ions arranged in layers. When exposed to air, the metals in a sodium battery’s cathode can be oxidized, decreasing the performance of the battery or even rendering it completely inactive. The researchers at IOC of CAS and Jiangxi Normal University sought to resolve this issue by substituting different types of metals in the cathode and increasing the space between these metals. 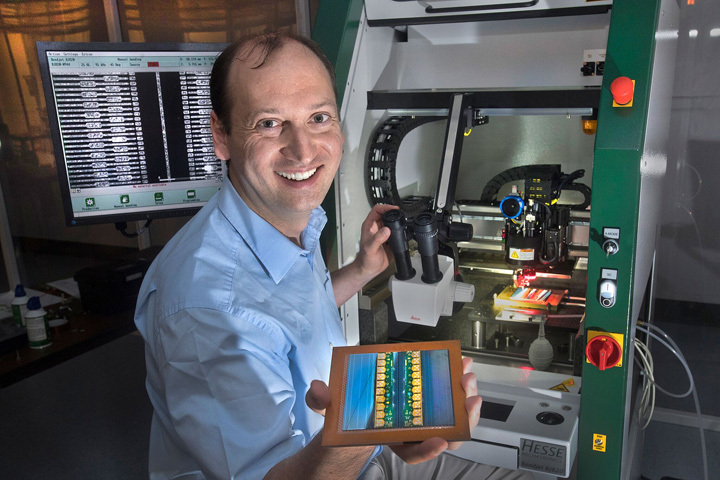 Then, using the Inner-Shell Spectroscopy (ISS) beamline at Brookhaven’s National Synchrotron Light Source II (NSLS-II)—a DOE Office of Science User Facility—Brookhaven’s researchers compared the structures of battery materials with unsubstituted materials to these new battery materials with substitute metals. The ISS beamline was the first operational x-ray spectroscopy beamline at NSLS-II. Here, researchers shine an ultra-bright x-ray beam through materials to observe how light is absorbed or reemitted. These observations allow researchers to study the structure of different materials, including their chemical and electronic states. 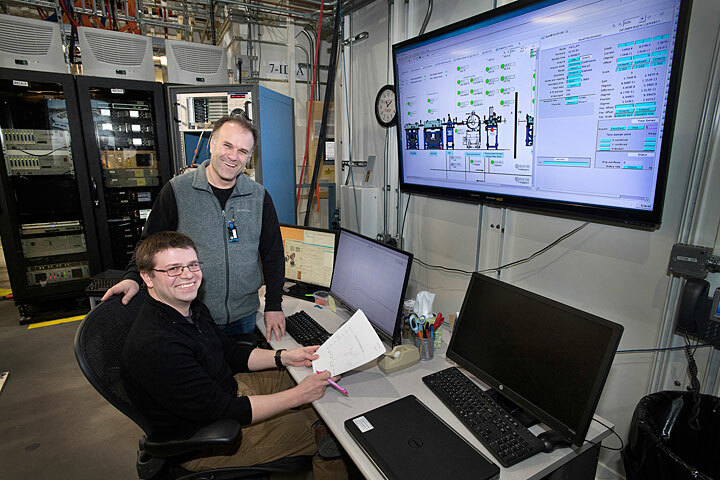 The ISS beamline, which is specifically designed for high-speed experiments, allowed the researchers to measure real-time changes in the battery during the charge-discharge processes. Based on their observations made at the beamline, Brookhaven’s team discovered that oxidation was suppressed in the sodium batteries with substituted metals, indicating the newly designed sodium batteries were stable when exposed to air. This is a major step forward in enabling future mass production of sodium batteries. 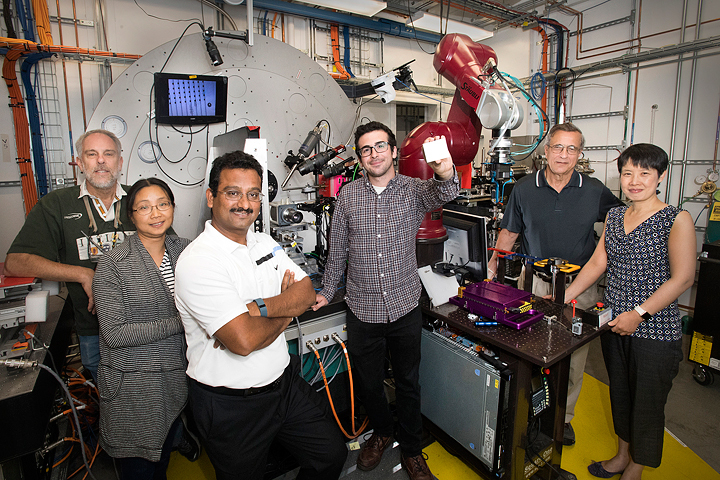 The researchers say this study[JACS] is the first of many that will use the ISS beamline at NSLS-II to advance the study of batteries. This study was supported by several Chinese research organizations, including the National Key R&D Program of China. 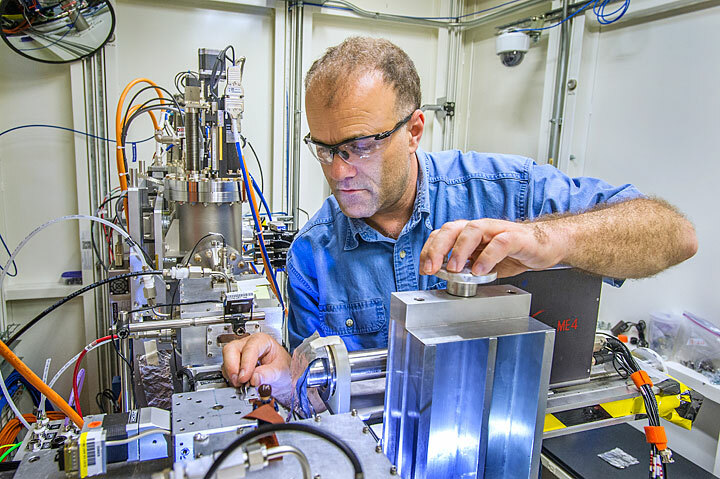 The work at Brookhaven National Laboratory was supported by DOE’s Office of Energy Efficiency and Renewable Energy, the Vehicle Technology Office under Advanced Battery Material Research (BMR). DOE’s Office of Science (BES) also supports operations at NSLS-II. Understanding how individual atoms enter and exit the nanoporous frameworks could help scientists design new materials for gas separation and nuclear waste remediation. 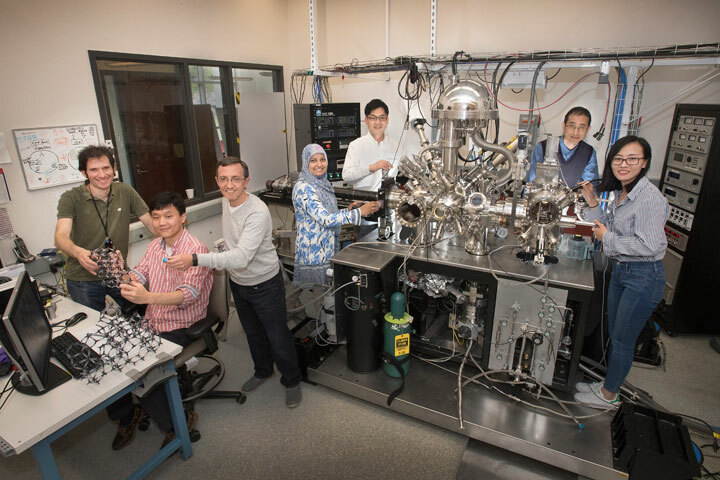 (Left to right) Anibal Boscoboinik, Jian-Qiang Zhong, Dario Stacchiola, Nusnin Akter, Taejin Kim, Deyu Lu, and Mengen Wang at Brookhaven Lab’s Center for Functional Nanomaterials (CFN). 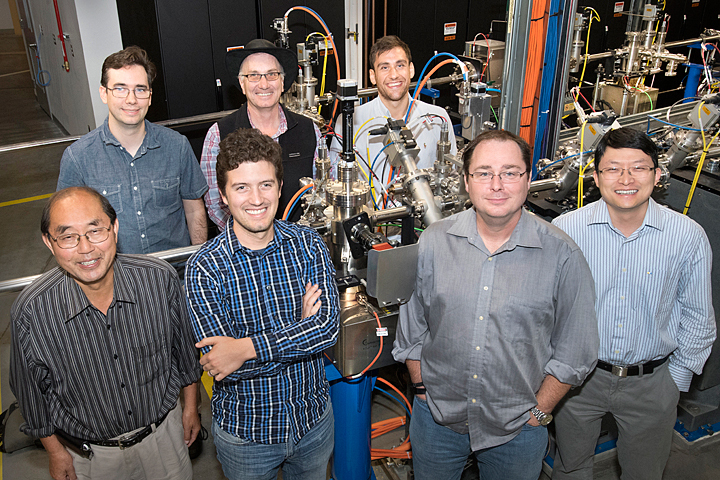 The team of scientists (including John Kestell and Alejandro Boscoboinik) carried out experiments at CFN, at Brookhaven’s National Synchrotron Light Source I and II, and in the Lab’s Chemistry Division to study the trapping of individual argon gas atoms (blue prop in Stacchiola’s hand) in two-dimensional (2D) nanoporous frameworks like the one Boscoboinik and Zhong are holding. They had been using these 2D frameworks as analogues to study catalysis in 3D porous materials called zeolites (structural model on the table), which speed up many important reactions such as the conversion of nitrogen-oxide emissions into nitrogen. Scientists at the U.S. Department of Energy’s (DOE) Brookhaven National Laboratory had just finished an experiment with a two-dimensional (2D) structure they synthesized for catalysis research when, to their surprise, they discovered that atoms of argon gas had gotten trapped inside the structure’s nanosized pores. Argon and other noble gases have previously been trapped in three-dimensional (3D) porous materials, but immobilizing them on surfaces had only been achieved by either cooling the gases to very low temperatures to condense them, or by accelerating gas ions to implant them directly into materials. “We are the first team to trap a noble gas in a 2D porous structure at room temperature,” said Anibal Boscoboinik, a materials scientist at Brookhaven Lab’s Center for Functional Nanomaterials (CFN), a DOE Office of Science User Facility where part of the research was conducted. 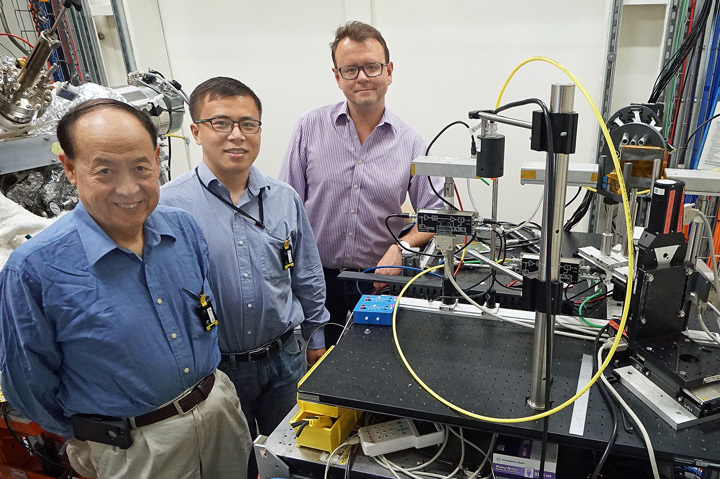 This achievement, reported in a paper published today in Nature Communications, will enable scientists to use traditional surface-science tools—such as x-ray photoelectron and infrared reflection absorption spectroscopy—to perform detailed studies of single gas atoms in confinement. The knowledge gained from such research could inform the design, selection, and improvement of adsorbent materials and membranes for capturing gases such as radioactive krypton and xenon generated by nuclear power plants. The team of scientists from Brookhaven Lab, Stony Brook University, and the National University of San Luis in Argentina synthesized 2D aluminosilicate (composed of aluminum, silicon, and oxygen) films on top of a ruthenium metal surface. The scientists created this 2D model catalyst material to study the chemical processes happening in the industrially used 3D catalyst (called a zeolite), which has a cage-like structure with open pores and channels the size of small molecules. Because the catalytically active surface is enclosed within these cavities, it is difficult to probe with traditional surface-science tools. The 2D analogue material has the same chemical composition and active site as the 3D porous zeolite but its active site is exposed on a flat surface, which is easier to access with such tools. To confirm that the argon atoms were trapped in these “nanocages,” the scientists exposed the 2D material to argon gas and measured the kinetic energy and number of electrons ejected from the surface after striking it with an x-ray beam. They performed these studies at the former National Synchrotron Light Source I (NSLS-I) and its successor facility, NSLS-II (both DOE Office of Science User Facilities at Brookhaven), with an instrument developed and operated by the CFN. Because the binding energies of core electrons are unique to each chemical element, the resulting spectra reveal the presence and concentration of elements on the surface. In a separate experiment conducted at the CFN, they grazed a beam of infrared light over the surface while introducing argon gas. When atoms absorb light of a specific wavelength, they undergo changes in their vibrational motions that are specific to that element’s molecular structure and chemical bonds. To get a better understanding of how the framework itself contributes to caging, the scientists investigated the trapping mechanism with silicate films, which are similar in structure to the aluminosilicates but contain no aluminum. In this case, they discovered that not all of the argon gets trapped in the cages—a small amount goes to the interface between the framework and ruthenium surface. This interface is too compressed in the aluminosilicate films for argon to squeeze in. After studying adsorption, the scientists examined the reverse process of desorption by incrementally increasing the temperature until the argon atoms completely released from the surface at 350 degrees Fahrenheit. They corroborated their experimental spectra with theoretical calculations of the amount of energy associated with argon entering and leaving the cages. In another infrared spectroscopy experiment conducted in Brookhaven’s Chemistry Division, they explored how the presence of argon in the cages affects the passage of carbon monoxide molecules through the framework. 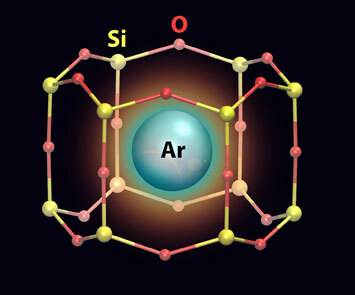 They found that argon restricts the number of molecules that adsorb onto the ruthenium surface. “In addition to trapping small atoms, the cages could be used as molecular sieves for filtering carbon monoxide and other small molecules, such as hydrogen and oxygen,” said first author Jian-Qiang Zhong, a CFN research associate. While their main goal going forward will be to continue investigating zeolite catalytic processes on the 2D material, the scientists are interested in learning the impact of different pore sizes on the materials’ ability to trap and filter gas molecules. This research used resources of the National Energy Research Scientific Computing Center, a DOE Office of Science User Facility at Lawrence Berkeley National Laboratory, and was supported by Brookhaven’s Laboratory Directed Research and Development program and the National Scientific and Technical Research Council (CONICET) of Argentina. Scientists tracked elusive waves of charge and spin that precede and follow the mysterious emergence of superconductivity. Superconductors carry electricity with perfect efficiency, unlike the inevitable waste inherent in traditional conductors like copper. But that perfection comes at the price of extreme cold—even so-called high-temperature superconductivity (HTS) only emerges well below zero degrees Fahrenheit. Discovering the ever-elusive mechanism behind HTS could revolutionize everything from regional power grids to wind turbines. Now, a collaboration led by the U.S. Department of Energy’s Brookhaven National Laboratory has discovered a surprising breakdown in the electron interactions that may underpin HTS. The scientists found that as superconductivity vanishes at higher temperatures, powerful waves of electrons begin to curiously uncouple and behave independently—like ocean waves splitting and rippling in different directions. The new study, published November 7 in the journal PNAS, explores the puzzling interplay between two key quantum properties of electrons: spin and charge. In the RIXS technique, intense x-rays deposit energy into the electron waves of atomically thin layers of high-temperature superconductors. The difference in x-ray energy before and after interaction reveals key information about the fundamental behavior of these exciting and mysterious materials. Scientists at Brookhaven Lab discovered in 1995 that spin and charge can lock together and form spatially modulated “stripes” at low temperatures in some HTS materials. Other materials, however, feature correlated electron charges rolling through as charge-density waves that appear to ignore spin entirely. Deepening the HTS mystery, charge and spin can also abandon independence and link together. Imagine knowing the precise chemical structure of ice, for example, but having no idea what happens as it transforms into liquid or vapor. With these copper-oxide superconductors, or cuprates, there is comparable mystery, but hidden within much more complex materials. Still, the scientists essentially needed to take a freezing-cold sample and meticulously warm it to track exactly how its properties change. The team turned to a well-established HTS material, lanthanum-barium copper-oxides (LBCO) known for strong stripe formations. Brookhaven Lab scientist Genda Gu painstakingly prepared the samples and customized the electron configurations. At low temperatures, the electron signals are powerful and easily detected, which is part of why their discovery happened decades ago. To tease out the more elusive signals at higher temperatures, the team needed unprecedented sensitivity. 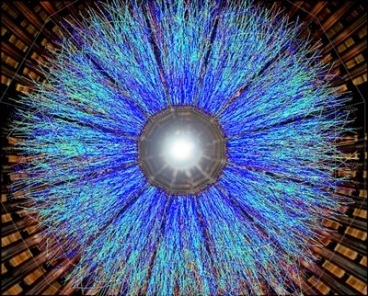 “We turned to the European Synchrotron Radiation Facility (ESRF) in France for the key experimental work,” Miao said. The team used a technique called resonant inelastic x-ray scattering (RIXS) to track position and charge of the electrons. A focused beam of x-rays strikes the material, deposits some energy, and then bounces off into detectors. Those scattered x-rays carry the signature of the electrons they hit along the way. 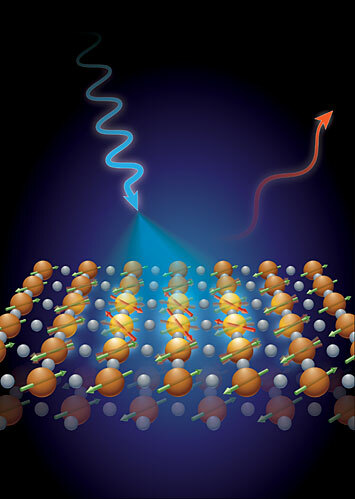 As the temperature rose in the samples, causing superconductivity to fade, the coupled waves of charge and spin began to unlock and move independently. That further exploration will include additional HTS materials as well as other synchrotron facilities, notably Brookhaven Lab’s National Synchrotron Light Source II (NSLS-II), a DOE Office of Science User Facility. Additional collaborators on the study include Yingying Peng, Giacomo Ghiringhelli, and Lucio Braicovich of the Politecnico di Milano, who contributed to the x-ray scattering, as well as José Lorenzana of the University of Rome, Götz Seibold of the Institute for Physics in Cottbus, Germany, and Robert Konik of Brookhaven Lab, who all contributed to the theory work. This research was funded by DOE’s Office of Science through Brookhaven Lab’s Center for Emergent Superconductivity. Thomas Caswell (left) and Dan Allan (right), two of Bluesky’s creators. 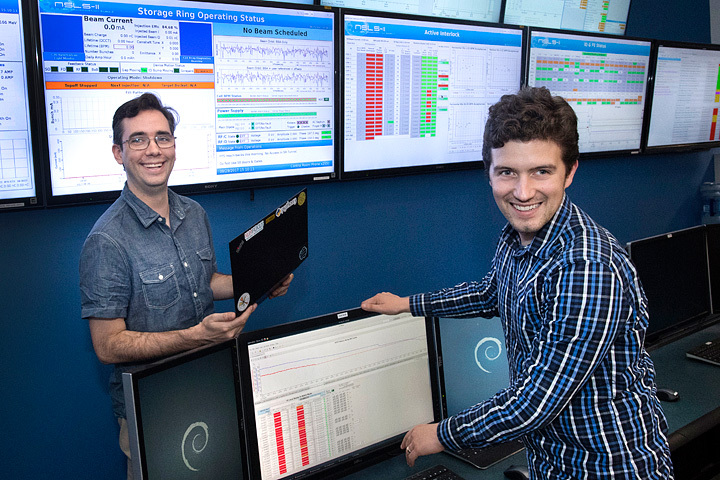 Scientists at the U.S. Department of Energy’s (DOE) Brookhaven National Laboratory have developed new software to streamline data acquisition (DAQ) at the National Synchrotron Light Source II (NSLS-II), a DOE Office of Science User Facility. Called “Bluesky,” the software significantly eases the process of collecting and comparing data at NSLS-II, and could be used to facilitate scientific collaboration between light sources worldwide. 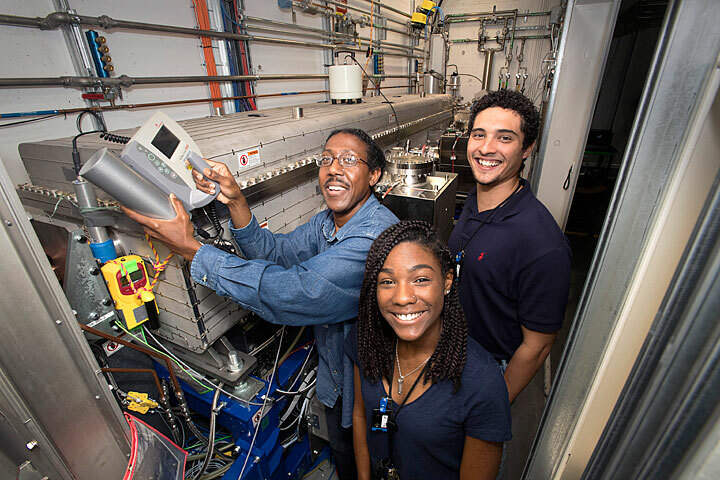 Mark Harvey (left), Kalifa Kelly (center), and Jesse Zapata (right) conducted research at the inner-shell spectroscopy beamline to improve safety and efficiency at NSLS-II. 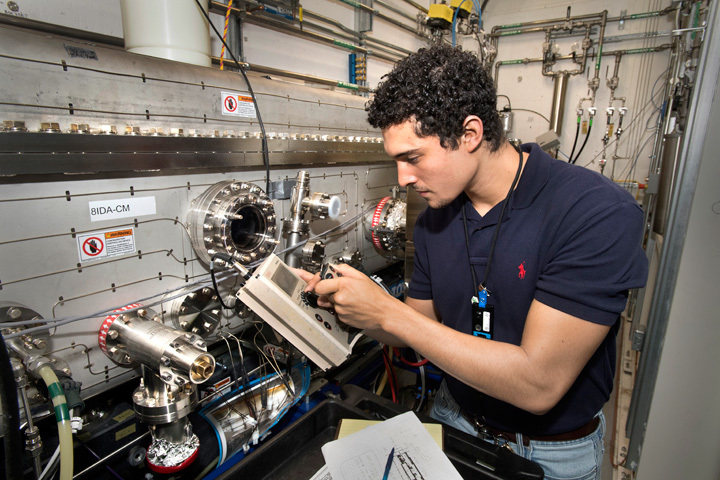 This summer, two student interns and their professor from Texas Southern University (TSU) are making a significant impact on the National Synchrotron Light Source II (NSLS-II), a U.S. Department of Energy Office of Science User Facility at Brookhaven National Laboratory. By collecting and analyzing radiation detector data, the research team is helping to enhance the safety features and reduce the construction costs of future beamlines (experimental stations) built at NSLS-II. Jesse Zapata and Kalifa Kelly—two rising seniors at TSU, a historically black college and university—along with their professor, Mark Harvey, came to Brookhaven through the National Science Foundation Louis Stokes Alliances for Minority Participation (NSF-LSAMP) program and Brookhaven’s Office of Educational Programs (OEP). NSF-LSAMP works to increase the number of minority students earning baccalaureate and advanced degrees in science, technology, engineering, and math [STEM]. After weeks of detailed instruction by Harvey in radiation physics and safety, Zapata and Kelly, in collaboration with NSLS-II staff, designed an experiment to remotely measure radiation fields inside a first optical enclosure (FOE), where NSLS-II’s bright and powerful x-ray light is focused at each beamline. Concrete, lead, and tungsten shielding are used to protect NSLS-II staff from this energy, but shielding the entire FOE with these materials is a costly endeavor. The TSU team, with guidance from staff scientists at NSLS-II, sought to determine how shielding could be localized within the FOE, reducing the amount of material needed while maintaining its overall effectiveness. The students and Harvey chose specific detectors to place at designated locations based on computerized models of the FOE radiation field created by Brookhaven radiation physicist Mo Benmerrouche. Then, they analyzed the data collected by these detectors over four weeks when NSLS-II was running, and developed a radiation map of the beamline that could be used by staff members at NSLS-II to design localized shielding for future beamlines. 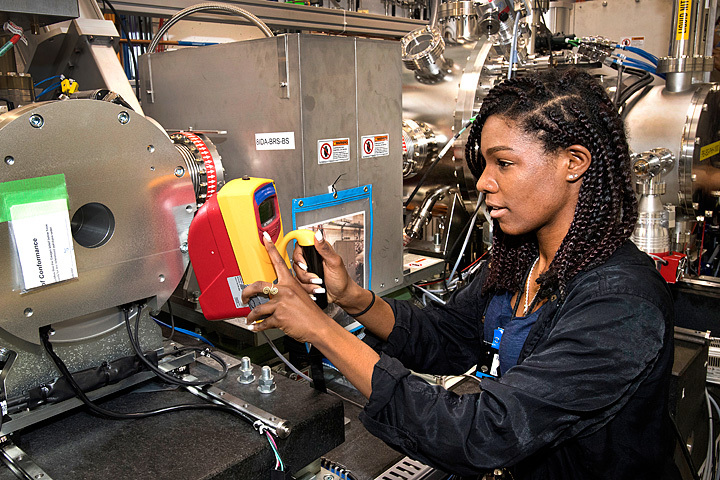 Kalifa Kelly is shown collecting data at beamline 8-ID, where the TSU team conducted their experiments. NSLS-II currently has 28 beamlines in operation or under construction, but the facility is only halfway built out. That means the data measured by the TSU research team could impact the construction of more than 30 additional beamlines. The localized shielding that can now be designed based on the team’s work would reduce the cost of building these beamlines, improve their safety features, and make NSLS-II more attractive for individuals and organizations to come to Brookhaven to build new beamlines and conduct research. Harvey, Zapata, and Kelly are not only improving NSLS-II; the students are also gaining a novel skillset that could propel their careers into new and critical areas of science research. “There is a huge demand across many fields of science for people who are educated and trained in radiation safety,” said Klaus Attenkofer, program manager of the hard x-ray spectroscopy beamlines at NSLS-II. Jesse Zapata is pictured analyzing x-ray detector data that the TSU team used to develop a radiation map. At the closing of their summer internship, Zapata and Kelly noted their work at Brookhaven has been a defining moment in their science education. Data for this project was recorded at the inner-shell spectroscopy (ISS) beamline 8-ID at NSLS-II. The ISS beamline is managed by Eli Stavitski and the hard x-ray spectroscopy program at NSLS-II is managed by Klaus Attenkofer. Additional support for this project was provided by Noel Blackburn, Deana Buckallew, Shawn Buckallew, Sean Carr, Sunil Chitra, Gregory Condemi, Henry Kahnhauser, Robert Lee, Andrew Levine, Subhash Sengupta, Reid Smith, Michelle Tolbert, Geraldine Townsend, Kimberly Wehunt and Bobby Wilson. In July of 2017, the U.S. Department of Energy’s (DOE) Brookhaven National Laboratory wished a happy second birthday to the National Synchrotron Light Source II (NSLS-II). Located at Brookhaven, NSLS-II is a DOE Office of Science User Facility that provides ultra-bright x-rays for cutting-edge science research. During its second year of user operations, NSLS-II reached significant milestones and added several beamlines that offer researchers exciting new capabilities across all fields of science. On July 17, the facility recorded 168 hours (seven days) of continuous beam, showcasing its stability and reliability. And on July 20, NSLS-II delivered user beam at 325 milliamps (mA) for the first time, creating the brightest light the facility has seen so far. Because NSLS-II is in its early years of operations, its level of brightness is still increasing; the goal is to reach 350 mA by the end of September. Reaching another milestone, NSLS-II named Joanna Krueger its 1000th lifetime user on June 28. A chemistry professor at the University of North Carolina at Charlotte, Krueger uses NSLS-II to study “sleeping beauty” transposase, an inactive enzyme found in fish that becomes active when inserted into human cells. The great number and diversity of researchers using NSLS-II is a huge success, especially considering the still-growing facility is operating at less than half its capacity. There are currently 20 beamlines (experimental stations) in operation but, when completed, NSLS-II will have 60 beamlines. In other words, at least 60 different experiments could occur at the same time. Eight new beamlines were added to NSLS-II during its second year, expanding the facility’s reach into new fields of research and allowing scientists to conduct experiments using new techniques. Joanna Krueger was named the 1000th user at NSLS-II on June 28. Krueger uses NSLS-II to study “sleeping beauty” transposase, an inactive enzyme found in fish that becomes active when inserted into human cells. The latest beamline to transition into operations was beamline 2-ID, which enables scientists to measure a sample’s response across a range of angles—nearly a full circle around the sample—using high-intensity soft x-rays. This technique is used to determine dynamics of electrons in a wide variety of materials. 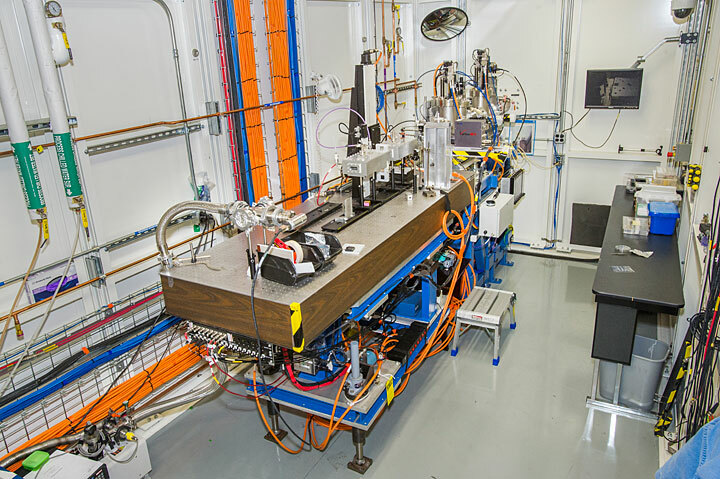 Beamline 2-ID is particularly notable for its ability to study light that bounces off individual atoms, but achieving world-class capabilities is the goal for every beamline at NSLS-II. Such is the case for 8-BM, a new beamline that uses tender x-rays to image and probe elements that are common in biological structures. 8-BM offers tender energy x-rays—x-rays with an energy from one kiloelectron volt (keV) to four keV—and, amongst other capabilities, allows scientists to study environmental questions – for example, how nuclear materials decay and affect the environment. Another new beamline, 4-ID, started general user operations in July. 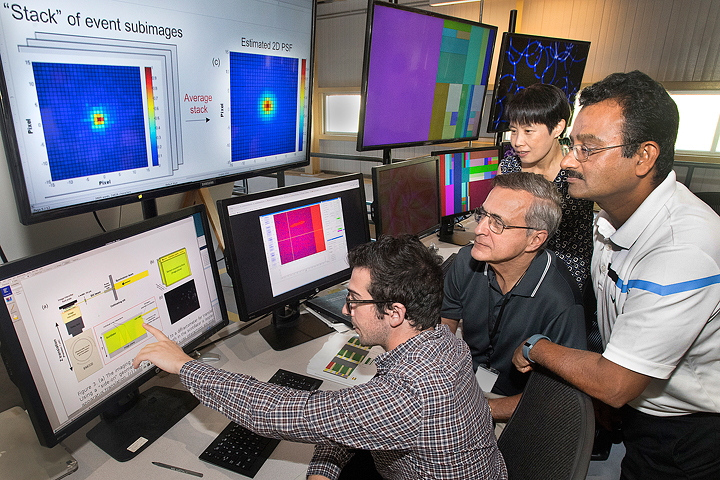 This beamline combines the versatile control of beam size, energy, and polarization to enable real-time studies of materials growth and processing, measurements of the atomic structure of functional surfaces and interfaces, and characterization of the electronic order in quantum materials. Brookhaven is also partnering with outside institutions to fund the construction and operations of new beamlines at NSLS-II. 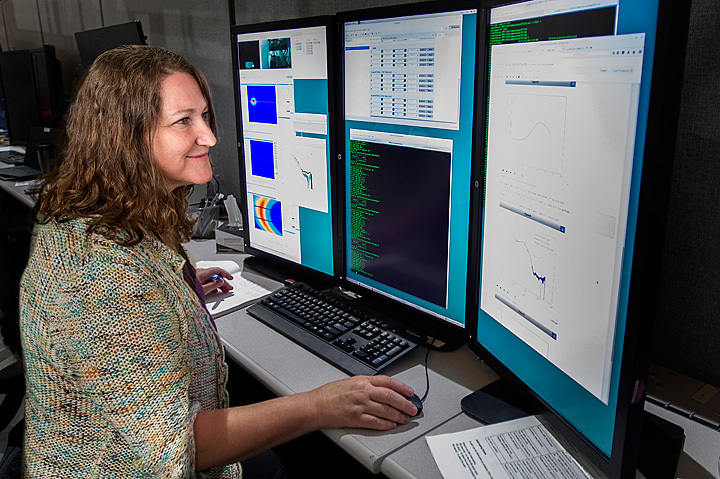 For example, beamline 17-BM was established through a partnership with the Case Center for Synchrotron Biosciences at Case Western Reserve University. This beamline uses wide-beam x-rays to modify proteins and monitor their structural changes, a “footprinting” technique that was previously unavailable at NSLS-II. 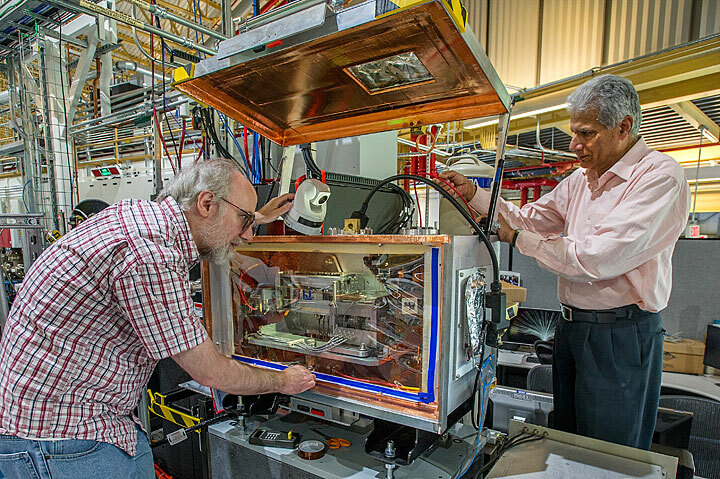 Scientists Paul Northrup and Syed Khalid are pictured with beamline 8-BM, the new tender energy x-ray beamline at NSLS-II. One of NSLS-II’s biggest partners is the National Institute of Standards and Technology (NIST), a government organization that promotes innovation and enhances industrial competitiveness in the U.S. NIST is funding the construction and operations of three beamlines at NSLS-II: two spectroscopy beamlines currently under construction, and beamline 6-BM, which had first light on July 25. At 6-BM, researchers can use x-ray absorption spectroscopy and x-ray diffraction to study how atoms stack together to make materials like batteries and computer chips. Other facilities within Brookhaven Lab are also working with NSLS-II on new beamlines, such as beamline 11-BM. This beamline was established through a partnership with Brookhaven’s Center for Functional Nanomaterials. The beamlines at NSLS-II are continuously undergoing changes to improve and expand their functionality. At beamline 3-ID, for example, scientists developed a new imaging method that allows researchers to view an x-ray-transparent sample in real time with quantitative phase measurement. In addition to opening new beamlines and making new research techniques available to scientists, NSLS-II’s second year of operations was notable for important scientific breakthroughs. Researchers used beamline 8-ID to develop new cathode materials that could facilitate the mass production of sodium batteries. 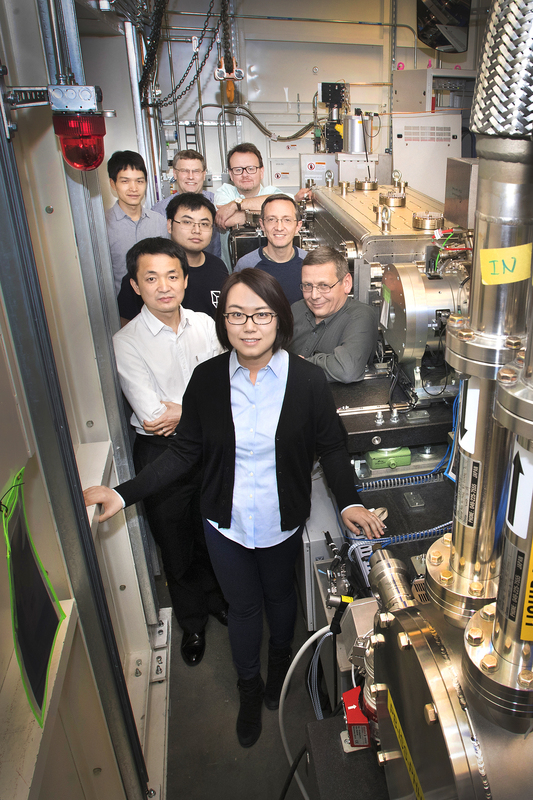 Another team of researchers used beamline 23-ID-1 to advance the study of high-temperature superconductivity, a phenomena that has baffled scientists for decades. The team discovered that static ordering of electrical charges may cooperate, rather than compete, with superconductivity. There is a bright future ahead for NSLS-II. 8 beamlines are currently under construction, and the NSLS-II team is working with the scientific community to develop the next set of beamlines to build. Other future plans for NSLS-II include streamlining logistics for users and making beam time available on multiple beamlines with a single proposal. From its world-class beamlines to the accessibility for its users, NSLS-II has already distinguished itself as a pillar of synchrotron science.